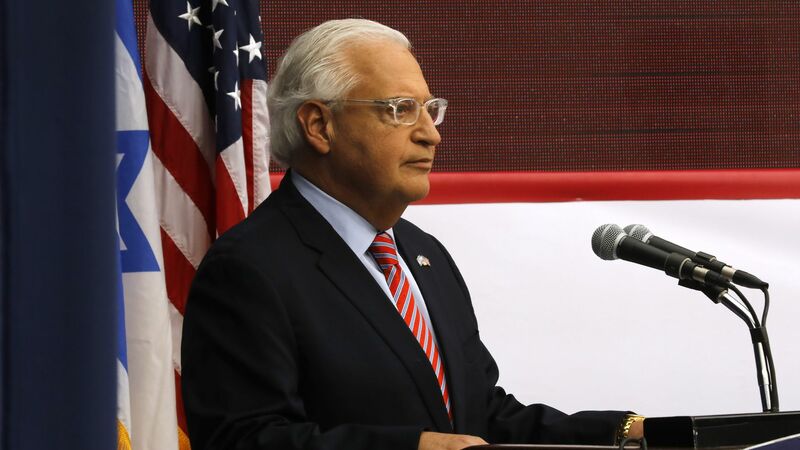 U.S. ambassador to Israel David Friedman told me today that it will be another few months before the White House launches its long awaited Middle East peace plan. On the Jerusalem embassy move: Friedman said Trump made the decision to move the embassy at a November Oval Office meeting in which he said, "lets do the right thing." Friedman denied that Trump's decision was the result of political pressure. On the U.S. peace plan: Friedman said Trump remains optimistic about the chances of a peace deal between Israel and the Palestinians, but will not force it on the parties. He said the peace plan will be presented "within months," and the White House is still "listening" to comments from different parties and thinking about the timing and the presentation. "We have confidence that if we are able to propose something that is in the best interest of the Palestinian people, the leadership will ultimately rise to the occasion or they will be forced to rise to the occasion. I think anything that we propose will be something that it's obvious that the Palestinians will be better off with it than without it." On the Iranian presence in Syria: Friedman said he doesn't feel the Israeli government is concerned about U.S. policies in Syria — including the possible removal of U.S. forces. He stressed that while Israel discusses Syria with the Russians, Netanyahu speaks more with Trump than with Vladimir Putin. He said, "the Israelis have been doing a very significant job trying to contain Iranian behavior in Syria." On Israel becoming a wedge issue in U.S. politics: Friedman said he was very concerned that no Democrats attended the embassy opening, and stressed that there had been an open invitation. Friedman told me: "From my perspective, American support for Israel needs to be bipartisan and I am going to do everything I can to support visits from legislators — blue or red." Q: Ambassador David Friedman, thank you for having us here in your new office at the U.S. embassy in Jerusalem. When people get married people ask them the day after, 'how does it feel?' So, does it feel any different? A: It feels great and I am happy to welcome you as the first reporter from Israel to visit, and you should visit many more times. Q: You were one of the leading Trump administration officials who pushed for moving the embassy to Jerusalem. The President considered doing it on day one, then he decided to wait, then he signed the waiver in June. What happened in November-December that got him to change course? A: I don't think anybody pushed the president. I think it was the president's decision and we were coming to this six-month cycle, and I think the president is fundamentally uncomfortable not keeping promises. He is not a traditional politician. As this cycle reemerged I think he very much wanted to keep his promise. He thought it was the right thing to do and that it was in the interest of the U.S. As you know, it has been in the law of the U.S. since 1995. Even then when the law was passed people were lamenting why did it take us so long in 1995 to get to this point. So he saw this as something he is committed to do and should do and that's how it came about. Q: Did this also have to do with political pressure – from people in the evangelical community who supported the President or pro-Israel figures like Sheldon Adelson? A: Not that I am aware of. I was with him in November in the Oval Office. I am not aware of any discussions where political considerations came into it at all. In fact I remember specifically the president saying lets do the right thing and I don’t think he cared about the politics. Q: So tell us about this meeting in November, because there were members of the administration who were against this move. A: I don't want to speak for others. It was a very robust debate. All the issues were raised. The conversation was at a high level and respectful. People made their points and the President decided. It was clear from the discussions that he asked all the right questions and analyzed it correctly. Ultimately he has decided it was in the best interest of the U.S. and something had to be done at that point. Q: Moving the embassy was one of the president's campaign promises. He fulfilled that promise. Another campaign promise was to get the "ultimate deal" between Israel and the Palestinians. Don't you think that at the end of the day, when you look at what happened in the last few months, by fulfilling one campaign promise he made the other campaign promise impossible to fulfill? A: First of all, give him time. He hasn’t failed on the ultimate deal. He is working on the ultimate deal and it is certainly too soon to write the postmortem on that. We believe this will in the long run facilitate a peace deal because it is a policy which is based on truth and reality. Those are the pillars upon which a deal will have to be made. Jared Kushner said something very intelligent at the ceremony. He said peace will come and when it comes people will look upon this day, May 14, the opening of the embassy as the day the peace process really began. A process in which the U.S. was committed to strength and to the truth. Q: But how will that take place? Since the president's announcement on December 6th the Palestinians are boycotting the White House. A: There have been bumps in the road. Q: That's the understatement of the century Mr. Ambassador. A: I was going to finish my sentence. There have been bumps in the road over the last 50 years. There have been ups and downs. We are still optimistic. At the end of the day, the peace deal will rise and fall on its merits, not on the basis of people's emotions. There is too much at stake and we have confidence that if we are able to propose something that is in the best interest of the Palestinian people, the leadership will ultimately rise to the occasion or they will be forced to rise to the occasion. Q: What do you mean they will be forced to? A: I believe in democracy. I believe in the will of the people. I think if you propose something that gains popular support I think the leadership ultimately has no choice but to move in that direction. Q: So you think the Palestinian people look at your peace plan, say it's not bad, and push the leadership to say yes? A: I think anything that we propose will be something that its obvious that the Palestinians will be better off with it than without it. That's certainly in the core of our thinking. Why bother if it doesn't create a better life and a better opportunity to both parties? Q: Prime Minister Netanyahu gave an interview to Vice News and said the embassy is in West Jerusalem. Do you think that part of the peace plan does lead to two capitals in Jerusalem – for Israel in West Jerusalem and for the Palestinians in East Jerusalem? A: I am very reluctant to get into specific terms of what we are talking about. I think on specifics people will have to wait. The President made it clear the U.S. isn't reaching any determinations regarding sovereignty, but beyond that you will have to wait with everybody else for the terms of the proposal. Q: So in any future negotiations, Jerusalem's borders will have to be negotiated between Israel and the Palestinians? A: It's a final status issue and all final status issues are subject to ongoing negotiations. Q: The peace plan is practically already drafted — do you see it being launched in the near future? A: I think within months. I can't give you a specific date. It is not finalized. There is a lot of listening going on. Mostly in Washington but here as well. We are continuing to think about it and it is not just the substance but also the timing and the presentation. So all those things are being factored into the calculus. But I would measure it in months. Q: So it is not going to be in the next few weeks? A: I don’t think so. We would certainly wait out of respect until Ramadan concludes, and beyond that I would be speculating. Q: What if the Palestinians say no? For now it seems obvious they will say no because they are saying your peace plan is Netanyahu's peace plan in U.S. disguise. A: Lets wait and see how it plays out. People say no for all kinds of reasons. Sometime they say no because they mean no and sometimes they say no because they want to negotiate something better. I have been doing this for a long time in different contexts. If I took no for an answer I wouldn’t have gone very far in my profession. Q: So you think that even if the Palestinians say no the President is not going to say, 'I am moving to another issue,' but he will try to see if a way can be found to promote this thing? A: I think if they say no, the question will be why they say no — try to understand their positions and see if there is a place to get to the right point. Q: Most Israelis and Palestinians say we do want a peace deal but on both sides there is very little belief that such a thing is possible. So why does the president believe such a deal can be found? A: He has always been an optimist. He has better powers of negotiation and persuasion than anybody else I have ever met. I think primarily he is looking for that win-win structure where everybody looks at it and says, 'we are better off than before.' It has to be presented as a circumstance where everybody is better off. It is not a punishment for anybody. So if people look at this and say we are being pulled or pushed it won't work. Q: So if the parties say no the president is not going to force them to take it. Q: Lets move on to the Iranian issue and the President's decision to withdraw from the Iran deal. Secretary Pompeo made a speech laying out 12 demands from the Iranians. But both President Trump and Secretary Pompeo basically said 'we are going to do it through pressure and sanctions' and didn't mention a military option against the Iranian nuclear program. Is the military option also on the table for the U.S. to prevent Iran from acquiring a nuclear weapon? A: You are going to have to ask them. This is not something I am given responsibility for so I will be very reluctant to get ahead of the administration on this. Q: The Obama administration said it prefers diplomacy but that the military option is on the table. A: All I can tell you is that between the president and Secretary Pompeo you have two of the best and smartest negotiators I have ever met. I have confidence in them but I will leave it to them to discuss the strategy. Q: So lets talk about the strategy and those 12 demands. It is pretty obvious it will be very hard for the Iranians to accept it, and then the question is whether the U.S. strategy is to change the Iranian behavior or to change the Iranian regime. A: The strategy is to protect American citizens and to protect the world. Sanctions were working before the JCPOA was in place. The U.S. economy is a juggernaut. It is tremendously important globally. I think most nations will choose to do business with the U.S. rather than do business with the Iranian regime. I think it’s a very sensible strategy that has a good chance to succeed. Q: So the U.S. doesn’t look for regime change in Iran? A: I think the U.S. sides with the Iranian people and will support the Iranian people. Our fight is not with the Iranian people but with the regime. I think the goal is to end all the rogue behavior not only on the nuclear issue but also on ballistic missiles, the encroachment through Yemen, Iraq and Syria, the financing of terrorism. That's the goal of the U.S.
Q: Lets talk about this rogue behavior. The president said he wants U.S. forces out of Syria. The Israeli government was very concerned by that and the prime minister spoke about it with the president. How can you stop the Iranians from establishing themselves militarily in Syria and create a land corridor to the Mediterranean while getting U.S. forces out of Syria? A: I have spent a fair amount of time with the Israeli government trying to understand whether they have any issues about U.S. policies (In Syria) — they haven’t. The Israelis have been doing a very significant job trying to contain Iranian behavior in Syria. So I am not aware this is a problem. I haven’t witnessed it on the Israeli side and I spend a lot of time with them. Q: But when Netanyahu wants to discuss Syria he is not going to the White House — he is going to the Kremlin. Does this bother you? A: I think he is speaking to both leaders. I guarantee you he speaks more with the president of the U.S. than with the leadership of Russia. It's an important relationship on both sides and things need to be coordinated there [in Syria]. I think the Prime Minister is taking appropriate action. Q: So you are not concerned by the fact there is a feeling the U.S. is going out of the region and Russia is going in? A: No. I think that is an oversimplification of what's happening. Q: Lets go back to the opening of the embassy – when I came in you were giving out red and blue baseball caps. A: I hope you got one. Q: Of course. I got a red one. But when I got in the ceremony itself was mainly red and felt very Republican. Weren’t you concerned that this ceremony was another proof that Israel is becoming a partisan issue in the U.S.? A: I was very concerned that no Democrats showed up. This was not our intent. We would have been delighted to host as many Democratic congressmen and senators as would have come. The invitation was open to all, or I should actually say we made it clear that everybody was welcome. We didn't specifically invite anyone. The Republican congressmen and senators who came did not come on the basis of a specific invitation. They reached out and they came. I would have been more than happy to host Democratic leaders and I hope they come in the future. From my perspective, American support for Israel needs to be bipartisan and I am going to do everything I can to support visits from legislators — blue or red. A: I went to this event yesterday — it was a completely apolitical event. It was a facility that treats disabled children. You cant get more apolitical than that. I was walking out the door and somebody rushes with a poster. I think it took a second. A picture gets taken and this is on the internet. I was mortified. I thought it was disrespectful and very stupid thing to do and I spent a lot of the last 24 hours to make it clear this does not represent my views and that the U.S. respect for the status quo at the Haram A-Sharif, the Temple Mount is still there, it is intact. Look, people do stupid things. I will have to be more careful the next time someone rushes at me with a picture. I have no idea what was in this person's head.